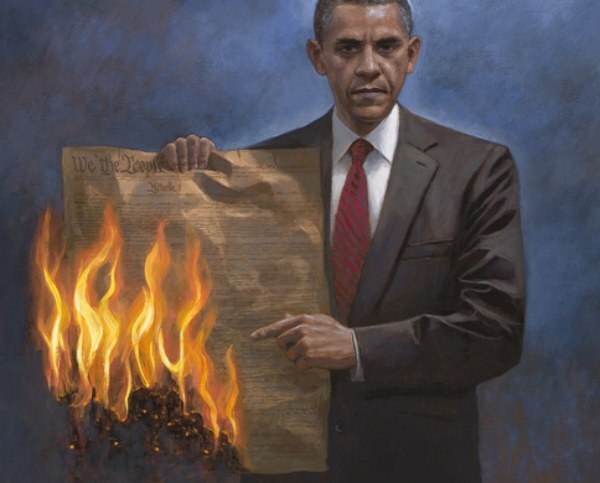 An artist in Utah is creating a bit of a stir for a painting he created that depicts President Obama holding a burning Constitution. The painting, “One Nation Under Socialism,” was created by Jon McNaughton, a politically conservative artist who has written that he believes the U.S. has been moving in the direction of socialism for the last 100 years. “One Nation Under Socialism” was unveiled late last week and has prompted heated invective on message boards and other online forums. The painting is the latest artistic salvo from McNaughton, who previously created a painting showing Obama stepping on the Constitution as the founding fathers look on in dejection. He has also created a painting showing Obama addressing a crowd of people who are weighed down by chains. The artist told the newspaper that he will support the Republican nominee for president and that he wants Obama out of office.